As if dealing with celiac disease isn’t enough, many people also have concurrent thyroid disease without even realizing it. Like celiac, thyroid disease typically stems from an autoimmune disorder. According to the American Thyroid Association, approximately 20 million Americans have some form of thyroid disease, but a shocking 60 percent of them don’t know they have the disease. Between 1.5 percent and 6.7 percent of those with an autoimmune thyroid disorder are also living with celiac disease. The butterfly-shaped thyroid gland is located in the lower portion of the neck. In addition to maintaining metabolism, the thyroid regulates other hormones and keeps organs functioning properly. This tiny gland is responsible for a large portion of the body. In someone with celiac disease, white blood cells will attack the small intestine lining; however, with an autoimmune thyroid disorder, the white blood cells mistake the thyroid gland as a foreign invader and attack the gland. An autoimmune thyroid disorder is typically the culprit for an underactive thyroid, known as Hashimoto’s disease, or an overactive thyroid, caused by Grave’s disease. Thyroid disease can appear at any age. Some women develop postpartum thyroiditis, which affects approximately 10 percent of women after giving birth. 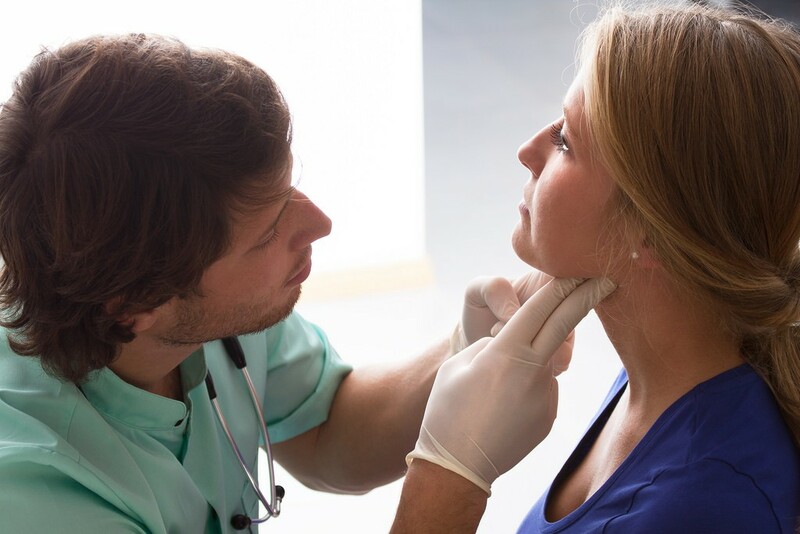 The main cause for thyroid disease is still unknown; however, some researchers believe it can be hereditary, come from an alternative autoimmune disorder or even be triggered by a traumatic event. Although more research is necessary, many doctors, researchers and patients believe there is a strong link between gluten and thyroid disease. According to current research, approximately 4.1 percent of adults who have a form of thyroid disease also have celiac disease. That same research estimates that 7.8 percent of children who are diagnosed with a form of thyroid disease also live with celiac. According to Amy Myers, M.D., founder of the Austin UltraHealth medical clinic in Austin, Texas, thyroid conditions start in the gut. She believes thyroid disease can develop from a leaky gut, which occurs when your small intestine becomes too penetrable and allows liquids and particles to flow through your bloodstream from your digestive tract. In fact, Myers finds that gluten tends to be one of the primary causes of leaky gut in her patients with gluten sensitivity or celiac disease. When someone who has gluten sensitivity or celiac disease eats gluten, the proteins from the gluten will go through the stomach, into the small intestine and force the body to produce a chemical called zonulin, which opens up the intestinal walls, allowing particles and liquids to flow. When this happens, over time the body becomes chronically inflamed, leaving one susceptible to developing an autoimmune disorder, such as thyroid disease and other serious conditions. When individuals with celiac disease stick to a gluten-free diet, their levels of anti-tTg–an antibody in the blood associated with celiac disease—usually return to normal. Consistent research shows that people with both celiac disease and a thyroid condition who follow a gluten-free eating regimen will not only reduce their celiac-related antibody levels, but they may also notice a decrease in their thyroid antibody levels. In a 2010 study published in the Journal of Pediatrics, 11 out of 15 children with celiac disease also had abnormal thyroid hormone levels. After 12 to 18 months of eating a gluten-free diet, those thyroid hormone levels began to decrease and return to normal.